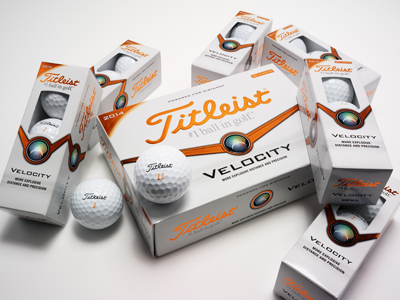 The 2014 Titleist Velocity golf ball is one of four new Titleist golf balls for 2014, alongside the NXT Tour, NXT Tour S and DT SoLo. The 2014 Titleist Velocity aims to provide golfers with even more distance after the pre-existing design was updated with innovative new core and cover technology. The Velocity is comprised of a reformulated, exclusive LSX core that produces fast ball speeds off the club face. Another feature of the 2014 Titleist Velocity is the 328 tetrahedral dimple design, which comes with seven different dimple sizes. This symmetrical dimple pattern provides a more uniform surface coverage to deliver a more penetrating ball flight, as well as a shallower angle of descent. A softer compression core – which facilitates a softer feel and increased green-side playability – is also used. The 2014 Titleist Velocity is available from February and comes with a suggested retail price of £25 per dozen.